Yesterday, over a leisurely breakfast, I read carefully the Diocese of Pittsburgh’s Diocesan Profile, red pen in hand. (See “Diocesan Profile Posted.”) I have also talked to a few people who were involved in its production. I can now offer a more considered opinion of the Pittsburgh product. I should preface my remarks by acknowledging that producing by committee a document as ambitious as this is a daunting task, one the reorganized diocese has never before attempted. No doubt, much attention was paid to content and much less attention was focused on the writing process. For whatever reason (or reasons), the schedule slipped, and the final editing and design became a frantic marathon. So, how good is the profile? The short answer is that it’s good enough to attract episcopal candidates, which, after all, is its raison d’être. It’s not as good as it could be, and it’s not as good as it should be. In what follows, I will offer a detailed evaluation of the document. Many of my observations will seem trivial, though some are decidedly not. In the end, I hope to point to how such a project might be better carried off next time around. This is not so much a follow-on to my last post on the profile as it is a fresh and comprehensive look at the document. The structure of the document seems to have been set late in the production process, so many design decisions had to be made late. Overall, the document is attractive, though I personally like to see pages more sharply defined by headers and footers. As it is, page numbers are often uncomfortably close to the document text. Pages do not feel cramped, however, even though the design was tightened to avoid creating an even longer document. The decision to bleed the cover picture and heading underlines is curious. Few people are going to read a nearly 30-page document on the screen, and few episcopal candidates are likely to have printers that can print edge-to-edge. There is inconsistency in the headings. For example, on pages 11 and 12, second-level headings do not match the structure seen in the table of contents. Also, some headings are underlined, whereas similarly situated headings are not. 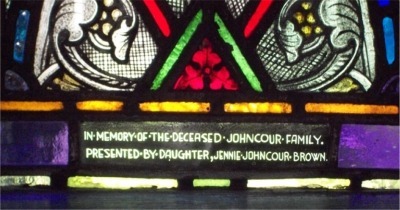 Some bodies that are named in headings are preceded with “The”; others are not. Colons end headings on page 3 and nowhere else. No doubt, problems such as these would have been fixed had more time been available for the final production phase. Generally, the typography is fine. The one exception is the prayer from Bishop Ashton Oxenden on page 3. It is unclear why a distinctive font is needed here, but it is quite clear that the choice of font was a colossal error. The text is hard to read and is out of character in the context of the rest of the document. Did the person who found this prayer insist on using this rather precious font? The use of hyphens, en-dashes, and em-dashes is inconsistent. 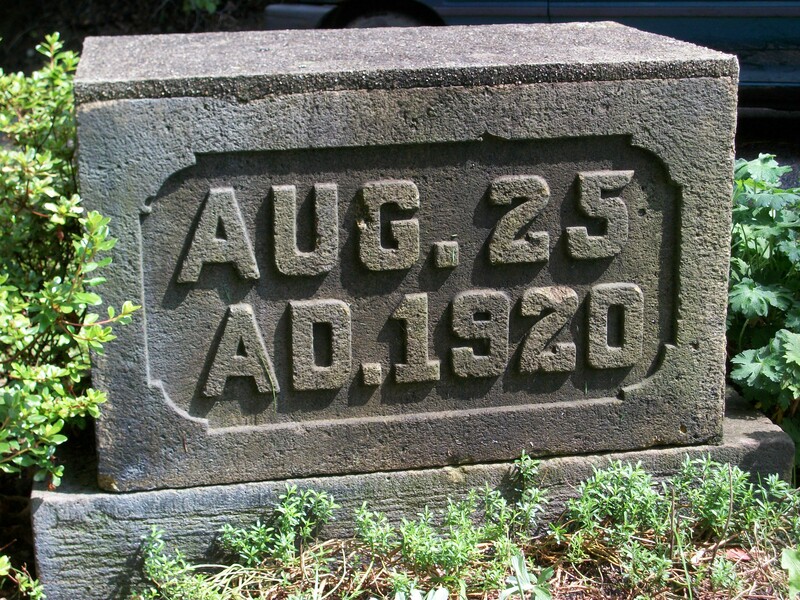 The proper glyph is not always used, and spaces appear around dashes as often as not. Almost certainly, the inconsistency is exacerbated by multiple authorship. The use of two hyphens before the identification of a quotation source is odd; I would expect an em-dash in such places. In at least one instance, two hyphens are used in lieu of em-dashes in the running text. In the table of contents, there is another inconsistency. Some section headings are followed by a space and some are not. Most readers less obsessive than I will not notice this. The many pictures add interest to the profile. My first impulse was to complain about the lack of captions. Captions would have lengthened the document, however, and probably wouldn’t have meant much to anyone outside the diocese. I would have liked to have seen more pictures of young adults, but their absence is more a problem with the diocese than with the profile. I particularly appreciated some of the historical illustrations, though I must say that the second picture on page 25 that seems to be illustrating our industrial past is totally inscrutable. The multiple authorship of the document is more apparent than it should be. No doubt, editing diminished inconsistencies, but it certainly did not eliminate them. I was encouraged after reading the Welcome! section (page 1). I made not a single red mark on the page for spelling, grammar, phrasing, or word choice. Alas, my optimism was quickly dispelled. I identified more than 35 missing commas and 7 missing hyphens in the remainder of the profile. Whereas nearly all of the text is written from a diocesan perspective—the appropriate viewpoint, I think—there are occasional lapses. The discussion of the Up 4 Reading program and Shepherd Wellness Community talk about “our local elementary school” and “Our mission” [emphasis added], respectively. Word choice is generally acceptable, although I found a few words to quibble with and references that will certainly wrinkle brows of readers outside the diocese. I did a serious double take when I encountered the phrase “without extensive withdrawals from our corpus.” “Corpus” is a financial term unfamiliar to most people (like potential episcopal candidates and bloggers like me) and “withdrawals from our corpus” seems too close to “take it out of our hide.” A less technical term would have been a better choice. 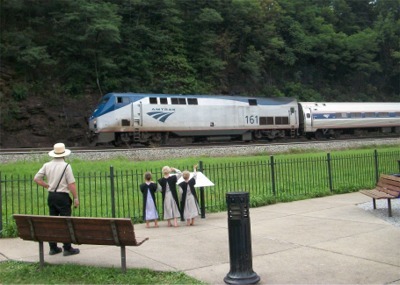 Given that potential candidates are certain to be aware of at least the broad outlines of the recent unpleasantness in the Diocese of Pittsburgh, a longish profile enumerating all our “vibrant Episcopal communities” is not inappropriate. 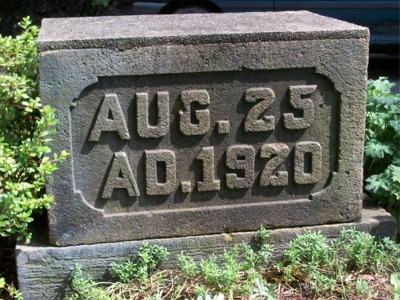 Moreover, “Pittsburgh” still conjures the mental image of “hell with the lid off” in many minds, so even the inclusion of the historical and geographical material at the end of the profile is easy to justify. On the other hand, the text suggests a certain ambivalence about admitting what the diocese has been through. It is important to note that we are emerging from the dark spiritual forest in which Bob Duncan had confined us, but it is equally important for potential candidates to recognize the deep hurt experienced, particularly by the clergy of our diocese, during our spiritual exile from the wider church. I believe that, curiously, the more moderate elements of the diocese that recognized what Bob Duncan was up to early and actively resisted his machinations emerged more hopeful and less cynical than the conservatives who were slow to do so but quick to criticize the Duncan opponents. In any case, although the name of our deposed bishop does occur several times in the profile, too little is said about him to fully inform potential candidates as to his activities and influence. I get the feeling that some of the authors of the profile think of Bob Duncan as He-Who-Must-Not-Be-Named. 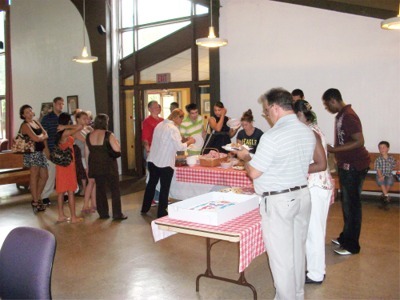 Progressive Episcopalians of Pittsburgh (PEP), which emerged from the ad-hoc group Those Opposed to Resolution One (TORO), which organized in late summer 2002, began attending Province III meetings in 2004. (Under Duncan, Pittsburgh sent no representatives to these meetings and made it impossible for clergy to attend by scheduling clergy conferences at the same time the provincial synod met.) 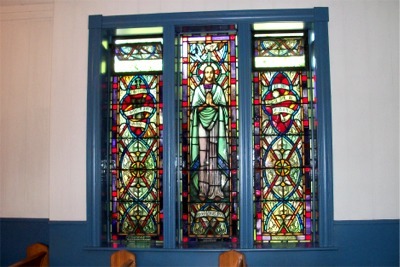 In November 2006, PEP invited Province III representatives to one of its meetings, and PEP organized the meetings in Maryland with Provincial president Bishop Bob Ihloff about six months later. It was PEP that sent out feelers to the twelve conservative clergy who had told Duncan that they would not leave The Episcopal Church with him. It was out of these contacts that Across the Aisle, which is mentioned in the profile, developed. PEP, however, is not mentioned. I have been told that PEP figured in earlier drafts, but the references to PEP were expurgated at some point in the editing process. 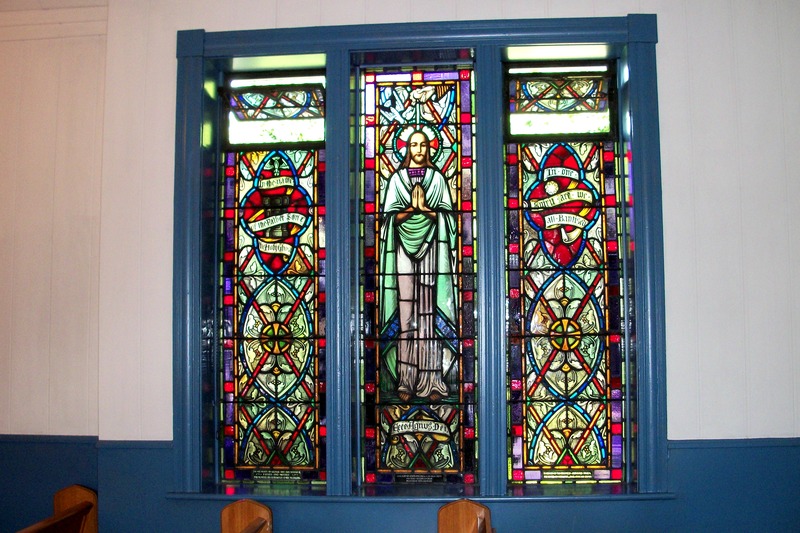 As a major player in PEP, I find this offensive, and I am concerned that it is a subtle attempt by conservatives of the diocese to downplay the role of more liberal Episcopalians and perhaps even to discourage liberal candidates from applying. 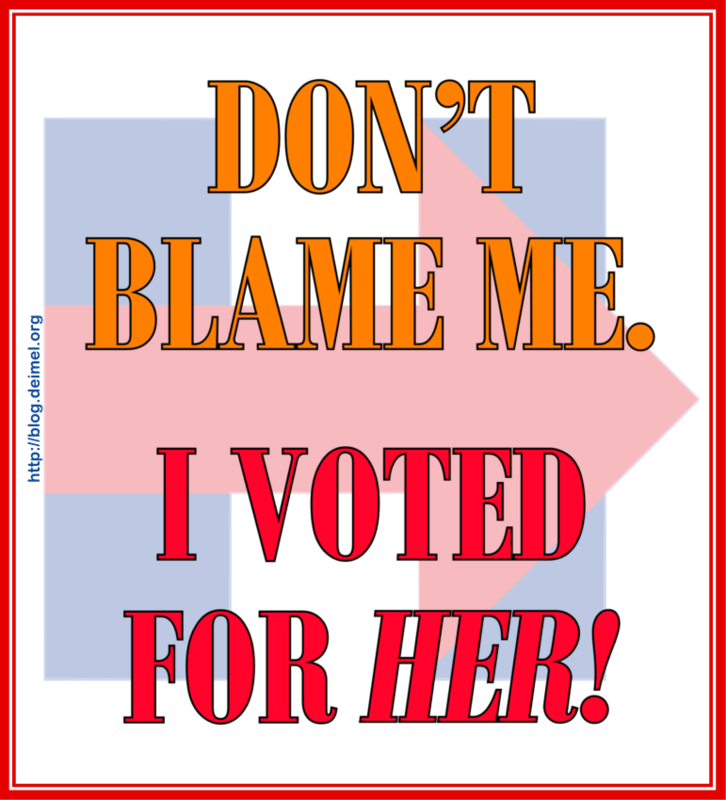 It may also reflect the guilt that some conservatives feel for coming so late to the party. In fact, the historical narrative in the profile refers to the improper October 2008 vote to separate the diocese from The Episcopal Church only indirectly, yet that is the most momentous event in the recent history of our diocese. The most important legal action in our history was the filing of the Calvary lawsuit in 2003, which is referred to in the profile not at all, yet it is most responsible for our diocese being more healthy (and wealthy) than the dioceses of San Joaquin, Fort Worth, or Quincy. Again, conservatives’ guilt may be reluctant to admit that the lawsuit, which was heavily criticized both within the diocese and without, and not by conservatives only, was, in fact, a brilliant move by Calvary rector Harold Lewis and attorney Walter DeForest. In a similar vein, the presentation of the operating budget on page 22 may raise more questions than it answers. What is the category “Other,” which accounts for more than 60% of diocesan income in the 2011 budget? Also, is not some comment in order about the category of “Legal Expenses,” which accounts for more than a quarter of the budget’s expenses? Other statistics are not to be found in the profile at all that might be of interest to candidates. In the Worship section on page 12, for example, various service options are enumerated. But how many people are attending Rite I versus Rite II services? How many people are attending Morning Prayer more often than Holy Eucharist? Such statistics would be more enlightening than simply saying that “Our liturgies are as diverse as our membership.” A candidate might want to know a breakdown of the seminaries attended by Pittsburgh clergy and perhaps how many were originally recruited from outside the diocese. 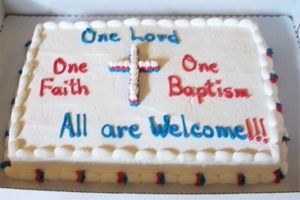 We are, one might argue, too inbred and have too many clergy from Trinity School for Ministry. Clergy diversity is a challenge for our next bishop. In fact, Trinity School for Ministry is itself a challenge and rather a problem for the diocese, something the profile tries hard to ignore. 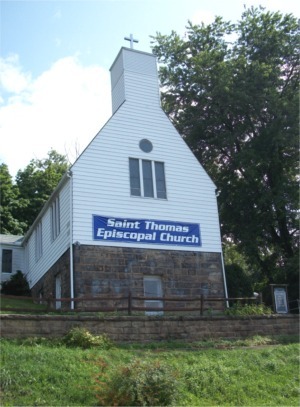 Trinity has been a primary engine for undermining The Episcopal Church in general and the Episcopal Diocese of Pittsburgh in particular. Likewise, the existence of a cathedral that claims to be a cathedral for both the Episcopal and the Anglican dioceses is a problem, one glossed over in the profile. Arguably such challenges should have been listed under Our Search—headings are not always the most obvious ones—on page 8. 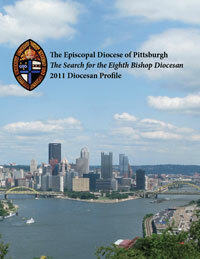 Pages 9 and 10 of the profile, in various ways, attempt to define what the diocese is looking for in a new bishop. Largely, the text addresses matters the Nominating Committee avoided asking ordinary parishioners about. The sections here are a mixed bag. 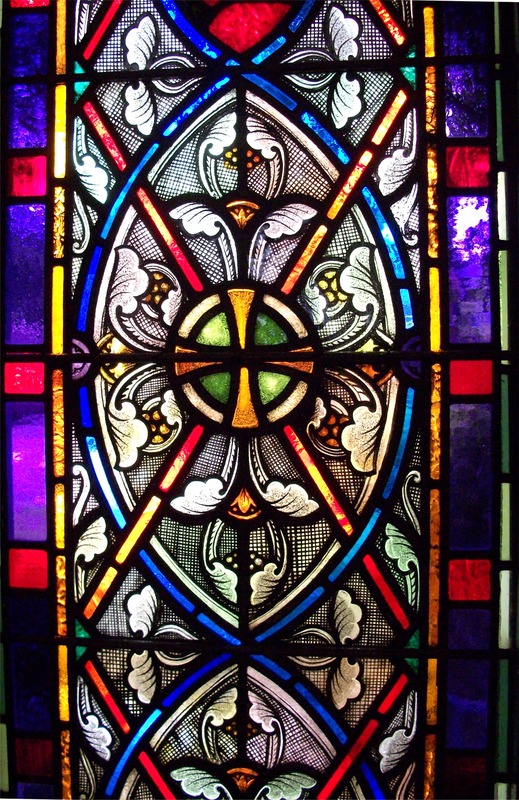 What do we value about being Episcopalian? is probably the best constructed section here. It reflects a very conscious affinity to the general church growing out of our past isolation from it. I would quibble about our valuing being part of the Anglican Communion, but, as Episcopal Church convenor for the No Anglican Covenant Coalition, I can at least assert that this value is not uniformly held in our diocese. I find What hopes and dreams do we have for a future with the new bishop called to serve our diocese? problematic. “Reconciliation with each other and with those who have left” seems to require qualification. I believe that reconciliation with those who left will not result in reunification in our lifetimes and is not even a reasonable aspiration before all property issues have been settled. Finally, I take exception to “Biblically focused,” which seem like code words for cutting two legs off the Anglican stool. I have no problem with “We believe Scripture contains all things necessary for salvation,” however. The section How can the new bishop help the diocese move forward? is mostly fluff that should have been—actually, is—incorporated in the section about who we are looking for. “Be a bishop of the people” is redundant, romantic poppycock. The profile mentions a number of entities without ever identifying them. This is not a serious problem, but it does tend to perplex the reader. Among the entities not properly identified is Old St. Luke’s and Christian Associates, which is actually Christian Associates of Southwest Pennsylvania. Finally, I am sorry that there is no concluding section in the diocesan profile. We have a Welcome! section but no Farewell! section. A short, concluding section inviting nominees would have offered a more elegant end to the document than does the sterile nomination submission form. As I suggested earlier, the profile clearly suffers from having been produced by a committee. It had to be produced by a committee, of course, it did not have to be developed as it was. Although individual sections may have gone through multiple drafts, the assembled document seems not to have done so. Multiple drafts were what was needed, however. I do not know if the schedule was too compressed or was sabotaged by delays. I suspect both. How could the process have been improved? First, I think a writer should have been hired to develop the text. Hiring someone would have assured that sufficient time was being spent on writing and that the writing would display substantial consistency. This does not mean that only the designated writer could produce text but that all text would at least be filtered through the stylistic sensibilities of a single person. There should have been an editorial committee of stakeholders with demonstrable editing skills. Drafts of the profile should have been released through the editorial committee. Others could then offer criticisms feeding into the next draft. Three complete drafts should have been enough. The person responsible for for document design should have been attached to the editorial committee, so the design could be developed in parallel with the text. All of the above assumes the availability of certain resources, of course, including time. Since I don’t know how approvals of the text were solicited, I don’t know just how various diocesan groups in the diocese had to fit into the development process. I do know that the Standing Committee, which is a very important body of the diocese, was given very little time to bless the final document. For better or worse, the job is done, and the profile has been thrown over the diocesan transom. 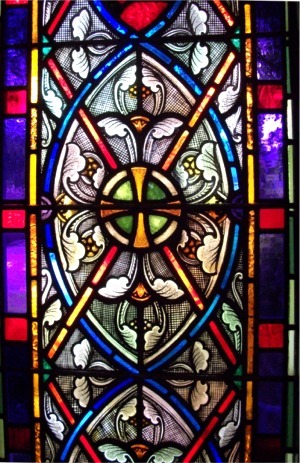 May the Holy Spirit guide the right candidates to our door and send others in a different direction. Too bad the Holy Spirit was not given a little more help. The Episcopal Diocese of Pittsburgh posted its Diocesan Profile as part of the search for the eighth Bishop of Pittsburgh late yesterday. The profile and other materials related to the bishop search can be found on the diocesan Web site here. The profile is a 29-page color PDF file with lots of pictures. I have never before read a diocesan profile, and I have only had a chance to scan this one, so I really cannot say how our document stacks up against other such documents. It’s pretty, and it’s fun searching for friends in the many photographs. I was a bit annoyed when I tried to view the file on my computer with Adobe Acrobat 8. I received a warning message, since the PDF generated is designed for Acrobat (or Reader) 9 or later. Presumably, some features are unavailable to me on this computer, but I don’t know what they might be. The document looks pretty much the same on my other computer, on which Adobe Reader 10 is installed. The presentation of the recent history of the diocese has several errors and significant omissions. I fear that these lapses may reflect a conservative bias, blindness, or guilt. What is described as “the recent division” is dated in the profile from 2003, but it was the so-called Resolution One in 2002 that first alarmed the moderate and liberal elements of the diocese and suggested that Bob Duncan was up to no good. That concern led to the establishment of Progressive Episcopalians of Pittsburgh (PEP) early in 2003, without which there likely would not have been discussions with the president of Province III in Maryland and the establishment of Across the Aisle. Likewise, the discussion of “property consequences” makes no mention of the Calvary lawsuit, without which our diocese would be in the same legal limbo and dire financial straits as the other dioceses that have experienced schism in recent years. It is significant that 815 discouraged filing of the lawsuit by Calvary Church, but that suit probably save the church and the diocese millions of dollars. Why do PEP and the Calvary lawsuit get no mention in the profile, even though they were responsible, in a very real sense, for saving the diocese? Enquiring minds want to know. It is 1:35 AM as I am writing this, and my reactions should be considered very preliminary. I may have more to say about the profile after I have had more time to reflect on it. In the end, I don’t know whether the profile is all that important, but I do think that potential candidates should have a more complete view of how Pittsburgh got to it present situation. In any case, anyone wishing to nominate someone to become Bishop of Pittsburgh can use the form of page 27 of the profile. Alternatively, he or she can suggest a nominee on the diocesan Web site here. “Multigrain,” of course, is a hot advertising term, one which says “healthful” to the average consumer. But isn’t oatmeal necessarily made from oats? Ingredients: Oatmeal (water, steel cut oats, rolled oats, brown sugar, contains 2% or less of flaxseed, buckwheat flour, whole wheat flour, salt), dried fruit blend (cranberries [cranberries, sugar, sunflower oil], golden raisins [contains sulfur dioxide as a preservative], wild blueberries [wild blueberries, sugar, malic acid, canola oil, natural flavor], cherries [red tart cherries, sugar, sunflower oil]), roasted nut blend (glazed walnuts [walnuts, sugar, natural flavor, canola oil], roasted almonds, glazed pecans [pecans, sugar, natural flavor, canola oil]), cinnamon brown sugar (brown sugar, cinnamon). Perhaps there is more than one reason for including the other grains. If oatmeal contains grains other than oats, however, is it really oatmeal? Originally, I planned only to call attention to the latest contribution by the Senior Pastor of St. David’s Anglican Church on the subject of the diocese he left, but I have decided that I need to do more than that. Some of the buzz being generated among the TEC-Pgh conservatives could be the result of a term used in psychology, Cognitive Dissonance, which is defined as “A condition of conflict or anxiety resulting from inconsistency between one’s beliefs and one’s actions, such as opposing the slaughter of animals and eating meat”. … For example, in this case, believing it is right to remain in the Episcopal Church and also not opposing its draconian policies. The theme of Wilson’s post, in the same spirit as his earlier one, is best characterized as “let’s you and him fight.” That is, he is trying to drive a wedge between conservatives and non-conservatives of the Episcopal Diocese of Pittsburgh. Some of the “gang of twelve” are giving in to the evil policies of The Episcopal Church or, at the very least, not opposing the direction of the church, Wilson complains. Of course, the “gang” was never the homogeneously conservative party that Wilson is making it out to be, so the cognitive dissonance being experienced by its members is likely quite diverse. The effect of his comments could easily be to drive a wedge between conservatives and conservatives within the Episcopal Diocese of Pittsburgh. It is interesting to see what Wilson chooses to mention. He observes, for example, “The election of the Rev. Leslie Riemer [sic], the progressive candidate and the defeat of the Rev. 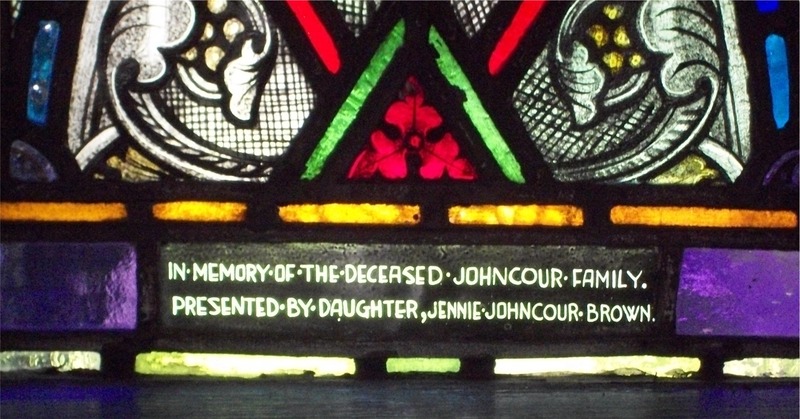 Jim Shoucair, the conservative candidate, for the Standing Committee clergy slot in last year’s diocesan election should give the TEC-Pgh conservatives pause.” To be sure, Reimer is more liberal than Shoucair, but she could as easily have been characterized as the woman candidate and Shoucair the man candidate. She comes from a larger church than her opponent, etc., etc. In short, it is not necessary to see Reimer’s election through a lens of conservative impotence. The real test, of course, will be the election of the next TEC bishop in Pittsburgh. That is why many of the progressives in TEC-Pgh will support the election of a candidate from outside their diocese. They want to make sure that a conservative who is gracious, largely respected, personally affable, and well spoken (and formerly supportive or even tolerable of former bishop, Bob Duncan) and from within the diocese has no chance being elected. In any case, Wilson has perhaps made clear that the more progressive elements of the Episcopal Diocese of Pittsburgh should not let down their guard. We are not yet one, happy, tolerant, and inclusive family. 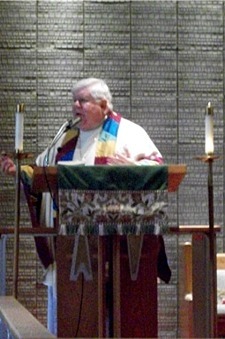 Wilson notes, “Two of the conservative clergy of the TEC emailed me off-blog [in response to his earlier post] and expressed private opinions and another clergyman requested we have lunch together—which we did.” Whether there were conspiratorial conversations between Anglican diocese and Episcopal diocese clergy, I do not know, but I do wonder what was said. Could we separate the two threads in this conversation? 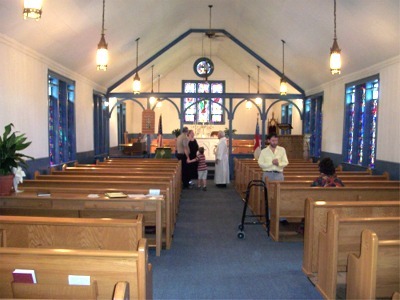 David’s original post implied that the conservatives who had stayed in the Episcopal diocese of Pittsburgh were becoming tolerant of the loose moral standards that characterise current Episcopal leadership, and concluded that because of this they cannot be expected to ‘ally themselves with us or support our position… They will not defend us’, presumably in regard to the property issue. What we can or should do in regard to the moral/doctrinal issues and what we can or should do in regard to the property issue are two different things. The conservatives are not of one mind about how to deal with the property issue, despite their common approach to the moral issue, and it would help discussion if that could be kept in mind. But the most important point regarding either issue is that conservatives are a minority in the Episcopal diocese, and on every one of its committees. At the moment we simply do not have the votes to stop the revision of standards in the diocese or to change the policies applied to property negotiations. Until that changes, there will be no change in diocesan policy in either area. David, you being recently (and reasonably) likened to Boss Tweed, I know you understand that those who don’t have the votes can’t stop those who do! The question is, therefore, what can be done to reform the church under these circumstances. The only thing I’d say about that today is this: the one thing that is absolutely certain is that to go on doing what conservatives have done in the Episcopal Church for the last forty years will not do it. Every conceivable rebuke has been hurled at the revisionists, and it has changed nothing. Every conceivable political stratagem has been used at diocesan and general conventions, and it has changed nothing. Anyone who continues to hope for reform of the Episcopal Church (as I do) must agree that it is time to try something else. Those of you who have commented about not being aware of any opposition to the new standards by the conservatives who have stayed may be looking for more of the sort of thing that was done in the past: fights on the floor of convention, refusing to let the bishop come and confirm, letters to the newspapers. You won’t see any of those things, but it’s because they haven’t worked, not because we are less committed to biblical moral standards. I do know that adherence to these standards has been urged on the Pittsburgh diocesan leadership, but not in a spirit of confrontation. As far as I know, we have no consensus about what should be tried instead, although David’s post might be stimulating progress towards that. The opinion I hear most, and share myself, is that the most effective thing is simply to go on preaching the pure word of God in our parishes, in the belief that God’s word does not return to Him empty, but prospers in the purpose for which He sent it. It’s true that such a policy won’t change things overnight, or even in my lifetime, but that doesn’t seem to be God’s plan. I know that the Bible was preached by many of those who pursued the policies that failed, but perhaps God wanted us to rely on His word and nothing else. I am disturbed to learn that my committee chair apparently considers me a “revisionist” and is seeking a new stratagem to change the direction of the diocese and general church. I do hope that our diocese is not seeking a new bishop too early. 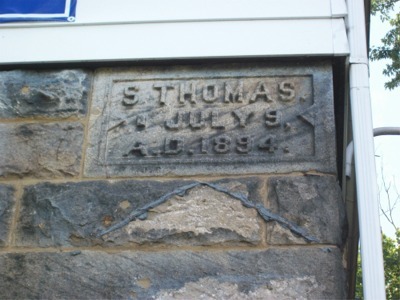 On Sunday, August 7, 2011, I again attended the service at St. James, Penn Hills. (Note: The Church seems to use “James” without an apostrophe, so I will do so here.) There were at least two reasons for visiting. 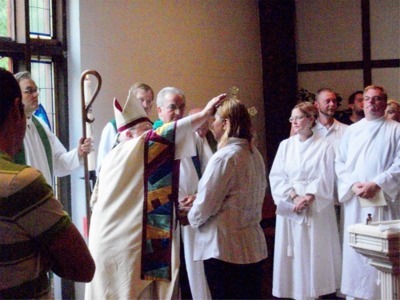 First, even though St. James has been restored to being an Episcopal church for only a month, Bishop Ken Price was to visit and perform a number of baptisms, receptions, and confirmations. 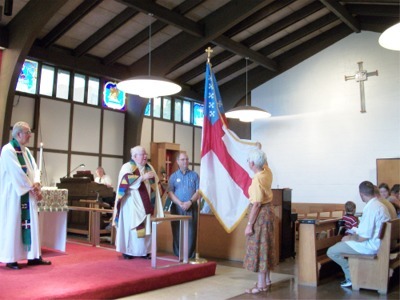 Second, in support of the resurrected Episcopal outpost, Progressive Episcopalians of Pittsburgh (PEP) was giving the church a new Episcopal Church flag. 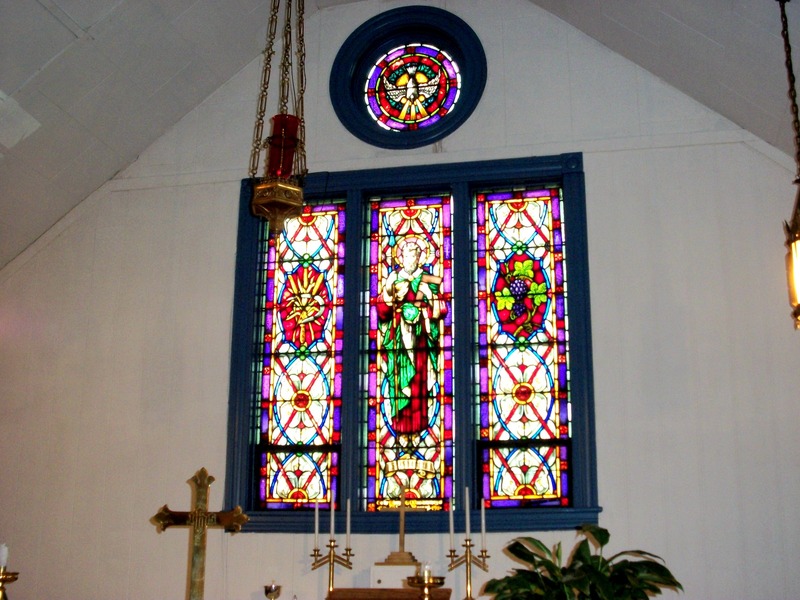 The departing “Anglicans” had left an Episcopal flag on a shelf. The flag was wrinkled and faded. A bright new flag seemed to have great symbolic value. Perhaps the most surprising aspect of Sunday’s service was the size of the congregation. I counted, albeit rather informally, more than 60 people. There were a few visiting clergy and some laypeople from other churches. I counted at least seven PEP members. 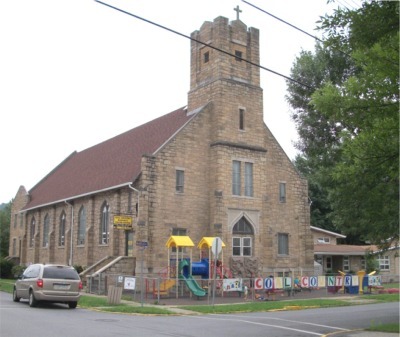 Remarkably, however, most members of the congregation apparently were thinking of themselves as members of the reconstituted St. James, Penn Hills. The service began, improbably, with several blasts from a shofar, but that was about the only unorthodox aspect to the service. 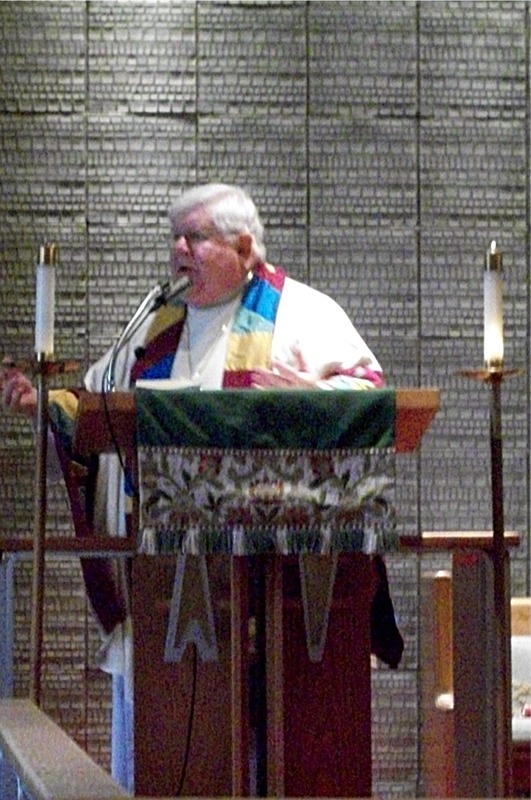 Bishop Price preached on the Beatitudes (see photo at left; click on this photo and others for a larger view), and found ways to apply the Gospel reading to developments at St. James. The solemnity of baptisms in Episcopal church depends greatly on architecture and the nature of the congregation. They are rather formal affairs at my own church, where the font is in the chancel and the priest performing the baptism is separated from the congregation by a low screen and a communion rail. Some clever rearranging of pews had been done at St. James to provide an open area at one side of the church to accommodate a rug and a recently donated marble font. The crowd gathered around the font made it difficult for many worshipers to see just what was going on and made picture-taking tricky. In any case, there were three or four baptisms, all of young children. (I was trying to take pictures and was not at as attentive to details as I might have been.) 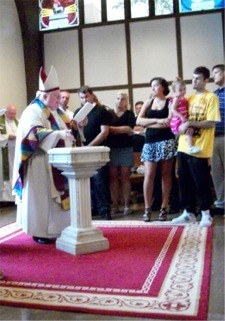 Baptisms were followed by a slightly larger number of receptions an confirmations performed in the same area. The Rev. Vicente Santiago performs a baptism. For the blessing of the new flag, the bishop called me to come forward. He also asked Joan Gundersen, PEP president who, performing her job with the diocese, had had much to do with seeing that the physical needs of St. James were taken care of. This little ceremony was mercifully brief. Lionel Deimel, PEP Vice President; Joan Gundersen, PEP President. Although offerings collected at a bishop’s visit are usually designated for the bishop’s discretionary fund or some other special ministry of the bishop, Bishop Price asked worshipers to be generous, as the collection would go directly to St. James. The Eucharist was performed with a loaf of whole grain bread, rather than with wafers. I like this practice, though it does make intinction somewhat problematic. 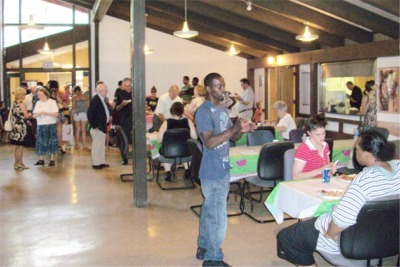 The service ended all too soon, and people retired to the parish hall, where a substantial lunch was being set out. A celebratory meal seemed appropriate, though the nine o’clock service put lunch rather early in the day. (I over-ate anyway.) St. James has a long tradition of having such an early service, and, although I’m not sure why that is the case, the tradition has been continued. Overall, the morning spent in Penn Hills was very uplifting and extremely encouraging. I am told that Penn Hills is one of the most diverse neighborhoods of Pittsburgh, and St. James is beginning to reflect that diversity. It was not so much diversity as sheer numbers that were most impressive, however. I was also struck by how smoothly the service ran; people did not seem to be struggling to figure out what goes on in an Episcopal service. I suspect this was because many of the new parishioners were refugees from the Roman Catholic Church, seeking all the liturgy and less of the guilt. I predict that St. James, Penn Hills, is facing a bright future. It is curious that we generally speak of thieves stealing, not thieving. It is also curious that stealer is rare. In principle, though not in practice, one can imagine this sentence: The stealer thieved the television. All Things Considered began its broadcast today with the search for an explanation for today’s big drop in the stock market. Perhaps the explanation for the market reversal is the realization, in light of the recent fight over the debt ceiling, that we are governed by idiots. Update, 8/5/2011: Apparently Standard and Poor’s agrees with me. The Rev. 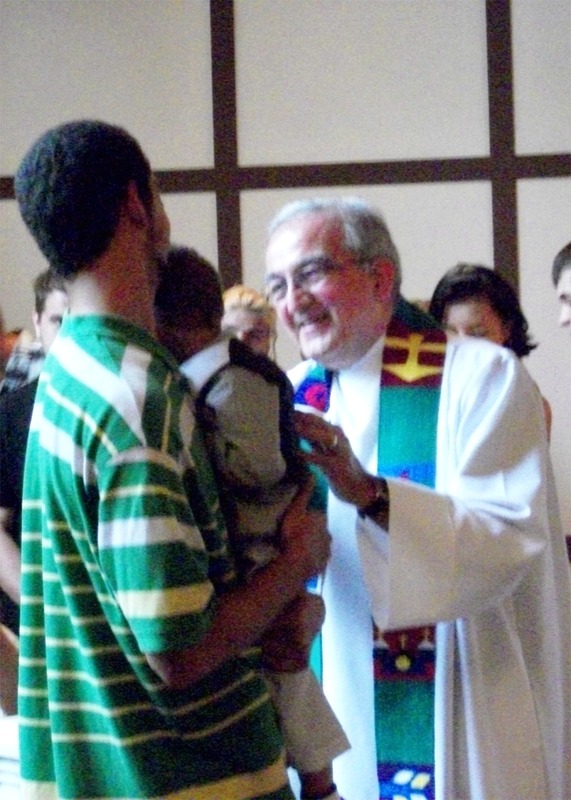 David Wilson, one of the most aggressively partisan Duncanite priests before the schism in the Episcopal Diocese of Pittsburgh and now a priest in Duncan’s Anglican Diocese of Pittsburgh, cannot seem to stop himself from throwing brickbats at his former colleagues. Wilson’s latest diatribe, “Has Something Changed Along the Way ? 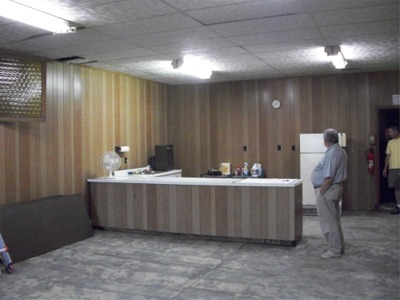 – Part 2,” appears on his blog, Anglican Yinzer. His real complaint, apparently, is that the twelve priests who announced in a January 28, 2008, letter that they were staying in The Episcopal Church are not doing a good job of effecting its “renewal and reformation,” as they implied they would be doing. Frankly, I cannot confirm the facts asserted by Wilson and, in any case, would not be as upset about them as he is. I suspect that at least some of his alleged “immorality“ was going on before the split of the diocese, so I wonder in what directions Wilson should be casting aspersions. Why do I write this? I write because I don’t want those of us in the ACNA Diocese of Pittsburgh to be naive. If we think our former mates over in TEC will somehow ally themselves with us or support our position and stand up on principle to the powers within the TEC diocese or the national church based on past affections or past convictions, we are sorely mistaken. Reconciliation and/or settlement with TEC has always meant capitulation to their position—nothing more and nothing less. His advice is not unreasonable, though the comment about capitulation is a little harsh. By the same token, Episcopalian clergy should not expect that their former colleagues are likely to rejoin The Episcopal Church, either, though at least one has already done so. Negotiating with crazy people leads to crazy agreements. You can find this and other gems of wisdom (or insanity) here. Why bother to elect a Democratic president if he’s going to implement Republican policies?